I spoke to my cousin for over an hour last night remembering Levi the Lion. My cousin and I were simply in tears laughing about how Levi was a Lion. I say we were laughing because we feel like he is still with us and he was always laughing and joking about everything, making light of all the darkness. Nothing was trouble for Levi everything surmountable! There are so many things that made him bigger then life. We can't believe that there was a man like Levi. When he moved to Tysons Corner he had no shul, we never heard of such a thing a religious person who shows up to start a place of worship where no one asked him to come. He was literally coming to nowhere and to nothing, no one hired him as a Rabbi. He saw a need, and he was just there to fill that need. He started doing services at the Embassy suites. It is unfathomable that someone would do this. Open services at the Embassy Suites on Route 7? Route 7 is practically a highway. People don't walk across route 7 and who was coming to the hotel? Who was really ever going to go to pray at the Embassy Suites? We never thought they'd last there. And then after a few years hundreds of people packed the Hotel for High Holidays to capacity , so much so that they had to take all 3 ballrooms. We can't even believe what he was able to accomplish. Levi used to go to neighborhoods and stop the car when he saw a mezuzah and get out and engage people in conversation. Maybe to some people this sounds normal but to secular people this is tough and would have to take a rock of a person to do such a thing. Levi never once complained and he made himself the giver. He was always giving, right up until his passing. Giving in his friendship and giving in his rabbinic role. Levi was the ultimate Tati. The few times I saw him with his kids and his wife it was so yummy to see --- totally devoted and contented with his blessings. He had BIG time nachas! I remember seeing him trying to read to his 4 kids but they were so in love with his spirit that all they wanted to do was climb all over him and laugh. Levi was so connected to Hashem that whoever he encountered was the beneficiary. Just being in his presence you felt you were a proud Jew, he had the power to turn on your soul. Pure light. My cousin and I remember the time two years ago before peasach, when we stopped by to say refuah shalayma and Levi was probably very sick and we knew he was sick but we thought he must be so much better, thank G-d, because he was up and walking around and in awesome spirits and entertaining us. And here we were trying to become more observant and we knew that Lubavitchers liked doing L'chaims and we brought this gigantic bottle of vodka or whiskey or something only to find out later that we totally traifed his house and he said nothing to make us feel like we did anything strange. Levi just put it away somewhere and didn't even make like it was an issue. Meanwhile he probably used up all his energy to greet us so that we wouldn't worry about his health. That is just only something a tzaddik would do! So many things Levi did that only a funny man would do, also take a strong man, with depth and courage, and with a great sense of humor. It took depth and courage to walk into the trouble of his type of shlichus, and he was just so successful, despite the fact that no one would have bet on his success in Tysons Corner. It is just WOW WOW WOW! MIRACULOUS that people like Levi and his family were created. I still can't believe, shaking my head, as if I saw the sea split in front of me that would make more sense. Darren says that as a result of Levi's coming he puts on tefilin everyday! And that he built a sukkah in his backyard. Growing up, the only holiday we had ever heard of is Chanukah, and all it symbolized was that Jewish kids get more presents. You can't even quantify how major his shlichus was. So many people who would otherwise never have experienced their Jewish soul in their lifetimes, being given the opportunity so many times daily!! Darren wants to come back to Crown Heights and visit the Rebbe and bring his whole family. Do you know what you did? Did you have a vision for it? Did you know how successful you'd be? Did you know it before you came? Sure, you Hashem at your back and you had the Rebbe's kochos. 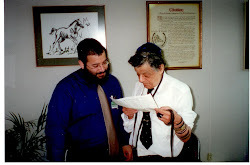 You are a Diamond of the Rebbe and we were a whole bunch of lucky people from Northern Virginia to know you! I didn't have a lot of personal time with Levi and Miriam but I had a handful of experiences with them. But Levi was just so cool that if you met him you just felt forever connected to him, he was the brother man! He made himself everybody's brother. Darren, Jill, Eva Gail and Irv, man they miss you Levi. They love you so much and they really have been so blessed these past eight years having you as their friend and mentor. Who knows what you started, sounds like teshuva, you really made a 10 on the Richter scale; you were some sort of quake. I have so many things I remember about Levi and I want to share them because it offers such great comfort to write them down and get them out. I hope that his family is comforted and not chas veshalom offended! It's just that Levi has such a living soul and I feel him still here and I feel like he is joking and laughing up in Heaven and knocking on all the doors to bring Moshiach Now. If anyone would get the job done, it would be Levi. This time we who formerly thought we were non believers, from Tysons Corner, believe in you and we are standing behind you, so make it happen! Bring Moshiach Levi, get everybody together up there and let em know we all want to see you again soon! I started wearing tefilin because of Rabbi Levi...I miss him...how can I not meet him one last time.